It was an interesting weekend for Destiny. Thanks to a new exploit, players got a closer-than-usual look at how the game’s loot system works. What we’ve found is that there’s something weird going on with exotic drops. Here’s a story: On Friday, Destiny’s weekend vendor Xur turned up for his first appearance since The Taken King launched and year two of Destiny began. Xur was selling a few specific pieces of exotic-tier armor along with engrams that could turn into any of the game’s exotic helmets. I blew a bunch of Strange Coins on helmet engrams and excitedly went to decode them. Bungie reps had talked a big game about how the new loot system will now take into account gear you already have and give you stuff you don’t have, and I was pumped to get some new stuff. The first helmet I got was An Insurmountable Skullfort, the same helmet I’d gotten as a drop after finishing the Nightfall strike a day earlier. Hmm. Not a great start. I decoded another engram and got Mask of the Third Man, which I had last year but hadn’t gotten in year two. Third engram: Another Insurmountable Skullfort. Jeez. Fourth engram… another Mask of the Third Man. What the heck? In the end, I got three new helmets out of about ten engrams; all the rest were duplicates. Once I heard about the Three of Coins exploit—a trick that allows you to quickly farm exotic engrams from a low-level boss—I went to test it out. Purely for research purposes, you understand. Then, because I am a degenerate, I kept testing. And testing. And testing. Many engrams later, I found that I was getting way more duplicates than should have been possible: Two Helm of Saint 14s, two or three The Last Words, three Invectives, three Telestos, a whopping four Light Beyond Nemesises, another couple Mask of the Third Mans. Something was off about this. Over the weekend, other players began sharing their own similar stories. A lengthy Reddit thread titled “Can we agree that exotic engrams are providing more duplicates than usual?” is filled with stories similar to mine, though the items in question vary. Players report decrypting seven, eight engrams and only getting two items with the rest being duplicates. Destiny has long been governed by the random number generator, known as RNG, or, to more spiritual players, “RNGesus.” The method by which Destiny decides who gets what item has been and will likely always be shrouded in some mystery. I and a lot of other players have long had the feeling that Destiny likes to give duplicate exotic items—almost every Destiny player has a story about how they went seven months without, say, a Hawkmoon, then got two in the same week. Things were supposed to have changed with The Taken King (which, I should note, is extremely impressive so far. Our full review will be up by the end of the week.). Thanks to the exotic exploit and the current small pool of year-two exotics, last weekend gave us the best chance we’ve had to try to understand how the system works. In direct response to feedback from the first year of Destiny from players who wanted more direct paths to acquiring exotic items, we chose to move many Year Two exotics out of the engram pool to allow players to identify and earn their preferred gear via quests and world drops. 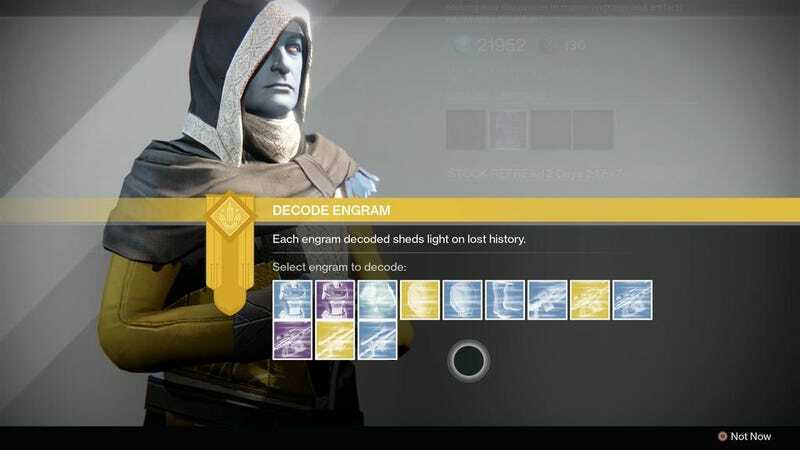 That means there is a select lineup of exotic gear available through engrams, and through Xur, which can repeat if players are gathering dozens of exotic engrams using Three of Coins. Throughout the year, we’ll be adding more exotic gear for players to collect, as well, and we’ll be monitoring feedback to determine the right balance between random rolls and direct paths to Year Two gear. It’s hard to feel that salty about duplicate items, given that the Three of Coins exploit gave most of us at least a few things we would’ve had to wait weeks or months for otherwise. Then again, before anyone knew about the exploit, I blew a ton of strange coins purchasing helmet engrams the “legit” way and they gave me a bunch of useless duplicates. Regardless, if you have a bunch of exotic engrams to decode, it’s probably best to space them out.